Based on the presenting symptoms, NMDs can be classified into disorders with sensory impairment, motor impairment, or both. Neuromuscular disorders can also be categorized roughly into hereditary or acquired neuromuscular NMDs.2 The breakdown of classifications based on the type of impairment at presentation include the following categories. Sensory impairment can be divided into negative symptoms and positive symptoms. Negative symptoms, which include numbness and loss of joint proprioception with unsteadiness, are often prominent in hereditary conditions such as Charcot Marie Tooth disease or severe neuropathy. Generally, the positive sensory symptoms, such as tingling, pins/needle sensation, and burning pain, are more commonly recognized by patients and the reason they seek medical attention. Peripheral neuropathy is the most common cause of sensory impairment. It can be divided into hereditary (often related to family history and genetic mutation) and acquired neuropathy. Depending on the area of involvement, neuropathy also can be classified into polyneuropathy, meaning multiple nerves are involved (e.g. distal symmetric polyneuropathy, brachial plexopathy), or mononeuropathy, such as carpal tunnel syndrome, cubital tunnel syndrome, or single level radiculopathies from a disc herniation or spinal stenosis. The most common acquired polyneuropathy is secondary to diabetes, which affects an estimated 50% of the older type 2 diabetic population.3,4 The most common mononeuropathy is carpal tunnel syndrome (median nerve entrapment at the wrist), followed by ulnar nerve entrapment at the elbow. Charcot Marie Tooth disease is the most common hereditary neuropathy and has variable sensory involvement. Motor impairment, manifested as muscle weakness and fatigue, can be secondary to motor neuron disease (such as amyotrophic lateral sclerosis), peripheral neuropathy (involving motor nerves), neuromuscular junction disorders (like myasthenia gravis), and myopathy. When it occurs with sensory impairment, peripheral neuropathy is the most common underlying cause. Muscle pain (myalgia) or cramps are rare manifestations of some myopathies. Each group of disorders can be further classified depending on the location of involvement and underlying etiology. Muscle weakness can be due to pain inhibition (from musculoskeletal conditions like arthritis). In contrast to the weakness accompanying pain, the weakness seen with neuromuscular disorders is more profound and often more progressive. Swallowing difficulty (dysphagia), speech problems (dysarthria), and drooping of upper eyelid (ptosis) can be manifestations of muscle weakness in the head and neck secondary to motor neuron disease, myopathy, or neuromuscular disorders. Mobility involves various types of movement, such as transferring from sitting to standing, walking, and stair/ramp negotiation. Motor impairments involving thigh and hip muscles limit the ability to stand, and can be caused by myopathy or neuropathy (lumbar plexopathy, amyotrophy, radiculopathy). Steady gait requires good balance and joint proprioception (the sense of the relative position of one's own parts of the body and strength of effort being employed in movement), which can be compromised in peripheral neuropathy with sensory impairment. Impairments of sensory and motor nerve functions are important risk factors for falls in older persons and relate directly to disability.5 If the distal muscles that cross the ankle are involved because of peripheral neuropathy or lumbosacral radiculopathy, patients may present with difficulty clearing their foot while walking, resulting in a dragging or slapping gait or “drop foot”. Upper extremity muscle strength and sensation are important for activities of daily living (ADL), therefore, impairments can cause significant disability. Difficulty with dressing, brushing teeth and combing hair can occur with weakness of the shoulder and arm caused by myopathy, brachial plexopathy or radiculopathy. Injury to the hand and wrist from carpal tunnel syndrome, radiculopathy, motor neuron disease, etc. can lead to dropping objects, difficulty with buttoning and other fine motor skills. 1. Dany A, Rapin A, Réveillère C, et al. Exploring quality of life in people with slowly-progressive neuromuscular disease. Disabil Rehabil 2017;39(13):1262-1270. doi: 10.1080/09638288.2016.1191552. 2. McDonald CM. Clinical approach to the diagnostic evaluation of hereditary and acquired neuromuscular diseases. Phys Med Rehabil Clin N Am 2012;23(3):495-563. 3. 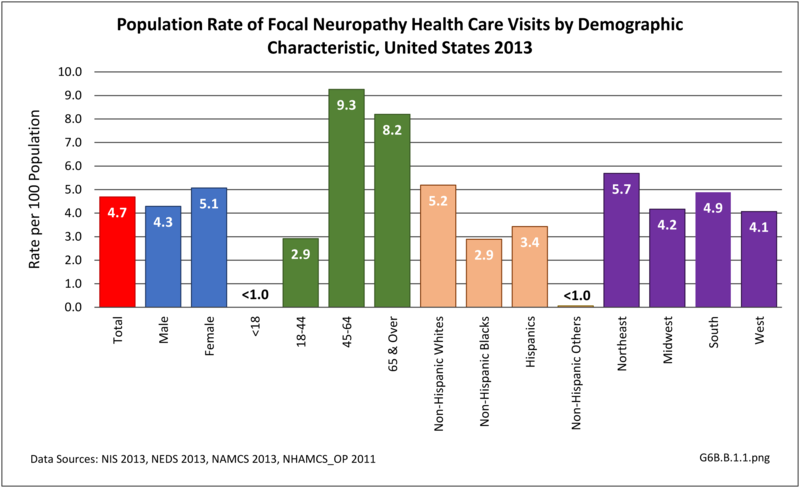 Dyck PJ, Katz KM, Karnes JL, Litchy WJ, Klein R, Pach JM: The prevalence by staged severity of various types of diabetic neuropathy, retinopathy and nephropathy in a population-based cohort: The Rochester Diabetic Neuropathy study. Neurology 1993;43:817-824. 5. Ward RE, Caserotti P, Cauley JA, et al. Mobility-related consequences of reduced lower-extremity peripheral nerve function with age: A systematic review. Aging Dis 2016;7(4):466-78. 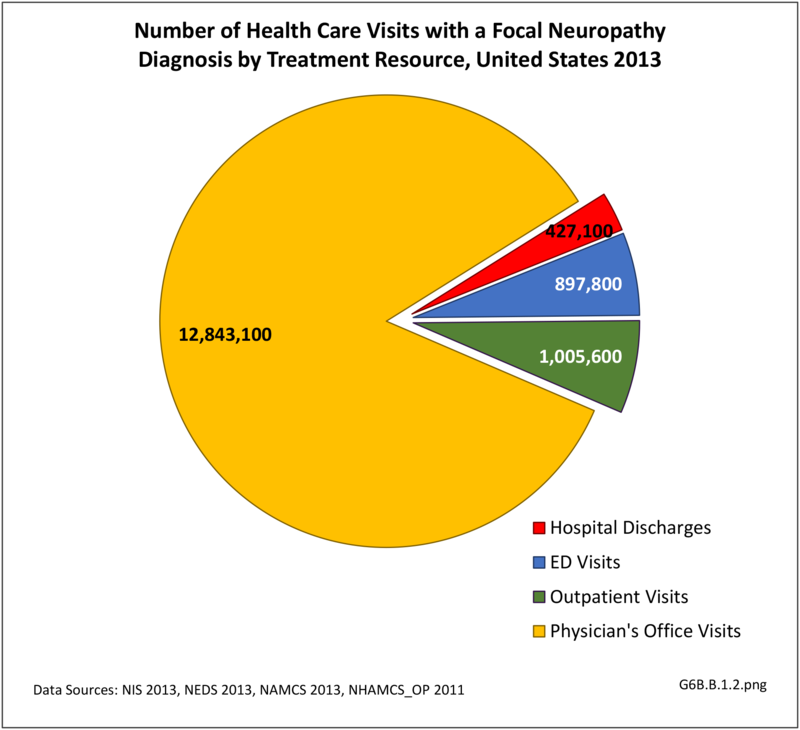 A focal neuropathy means only one or, at most, a few nerves are injured. Pain, numbness, and weakness are confined to a single limb or a small region of the trunk or head. Focal neuropathies are typically caused by compression or trauma. Carpal tunnel syndrome is an example of a focal neuropathy (as described below). Mononeuropathy is a form of neuropathy that affects a single nerve or, more rarely, a nerve group (mononeuritis multiplex). There may or may not be pain, followed by loss of sensation, strength, and overall function, depending on the type. These types of neuropathies are typically due to injury, compression, aging, inflammatory disorders, or other systemic diseases. Examples of mononeuropathy include carpal tunnel syndrome, ulnar neuropathy, trigeminal neuralgia, radial neuropathy, peroneal neuropathy, radiculopathy, and occipital neuralgia. Mononeuropathy can develop if there has been a prolonged period of swelling or pressure placed on a specific point in the body such as the hands, feet, or face. Symptoms of mononeuropathy include loss of feeling, tingling, burning, muscle weakness, and paralysis. Mononeuropathy can develop if there has been a prolonged period of swelling or pressure placed on a specific point in the body such as the hands, feet or face. Symptoms of mononeuropathy include loss of feeling, tingling, burning, muscle weakness, and paralysis. Carpal tunnel syndrome is the most common mononeuropathy and is caused by entrapment of the median nerve in the carpal tunnel at the wrist. It is a slowly progressive condition causing tingling, numbness, and pain in the hand and fingers (possibly sparing the pinky finger), with weakness and wasting of muscle at the base of the thumb. Based on different studies, the incidence varies between 0.99 to 3.5 persons per 1,000 person-years.1,2 Higher incidence has been reported in women and working populations requiring repetitive wrist motions. Carpal tunnel syndrome is diagnosed based on clinical information (history and physical examination) and confirmed by electrodiagnostic tests (EDx) consisting of nerve conduction studies (NCS) and electromyography (EMG). Ulnar neuropathy is the second most common entrapment neuropathy and most commonly occurs at the elbow. It presents with weakness of the hand, along with tingling, numbness, and pain in the inner side of the hand and fingers (half of ring finger and pinky). It is often triggered from irritation of the “funny bone” where the nerve is exposed along the inner aspect of the elbow. The brachial plexus is a network of nerves that originate in the neck and branch off to form most of the other nerves that control movement and sensation in the upper limbs, including the shoulder, arm, forearm, and hand. The radial, median, and ulnar nerves originate from the brachial plexus. Brachial plexus injury (BPI) is an umbrella term for a variety of conditions that may impair function of the brachial plexus nerve network. Most pediatric and adult brachial plexus injuries are caused by birth or trauma respectively, such as high-speed vehicular or motorcycle accidents, blunt trauma, stab or gunshot wounds. It can also be the result of inflammatory processes, compression (e.g., caused by a growing tumor, thickened muscles, or the collar bone), or genetic mutation. Symptoms are pain, loss of sensation, muscle weakness, and varying degrees of paralysis. Radiculopathy is a nerve root disorder that can cause numbness, tingling, pain, and weakness. It is typically caused by acute or chronic pressure on a nerve root as it exits the spinal canal. The most common cause is a herniated intervertebral disc in younger patients, and spinal stenosis, or narrowing of the spinal canal, in older patients. There are also several less common causes such as meningitis, tumors, diabetes, and infections. 1. Wolf JM, Mountcastle S, Owens BD. Incidence of carpal tunnel syndrome in the US military population. Hand (NY) 2009;4(3):289-93. 2. Nordstrom DL, DeStefano F, Vierkant RA, Layde PM. Incidence of diagnosed carpal tunnel syndrome in a general population. Epidemiology 1998;9(3):342-5. 3. Tarulli AW, Raynor EM. Lumbosacral radiculopathy. Neurol Clin 2007;25(2):387-405. 4. Casey E. Natural history of radiculopathy. Phys Med Rehabil Clin N Am 2011;22(1):1-5. 1. Seror P. Carpal tunnel syndrome in the elderly: "Beware of severe cases". Ann Chir Main Memb Super 1991;10(3):217-25. 2. Benoist M. Natural history of the aging spine. European Spine Journal 2003;12(suppl 2):S86-S89. 1. McCorquodale D, Pucillo EM, Johnson NE. Management of Charcot–Marie–Tooth disease: Improving long-term care with a multidisciplinary approach. Journal of Multidisciplinary Healthcare 2016;9:7-19. 2. Sadosky A, et al. Healthcare utilization and costs in diabetes relative to the clinical spectrum of painful diabetic peripheral neuropathy. J Diabetes Complications 2015;29(2):212-7. 1. Verghese J, Bieri PL, Gellido C, et al. 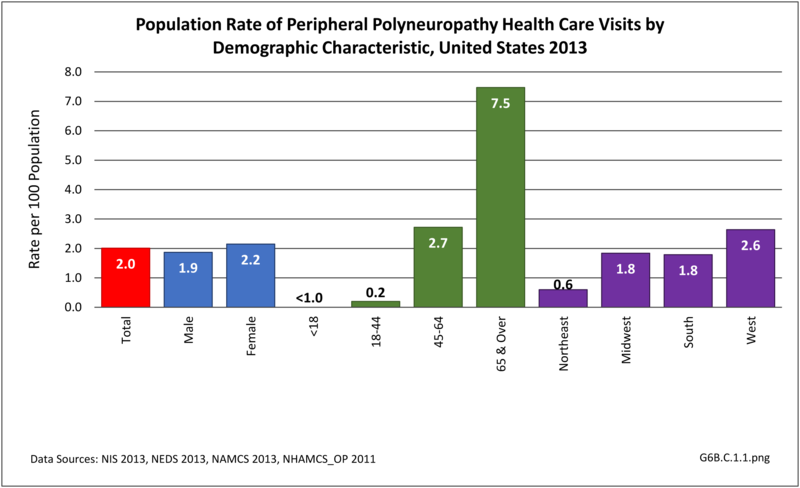 Peripheral neuropathy in young-old and old-old patients. Muscle & Nerve 2001;24(11):1476-1481. 2. Richardson JK, Ching C, Hurvitz EA. The relationship between electromyographically documented peripheral neuropathy and falls. J Am Geriatr Soc 1992;40(10):1008-12. 3. Timar B, Timar R, Gaită L, et al. The impact of diabetic neuropathy on balance and on the risk of falls in patients with Type 2 Diabetes Mellitus: A cross-sectional study. PLoS ONE 2016;11(4):e0154654. 1. Mehra M, Merchant S, Gupta S, Potiuri RC. 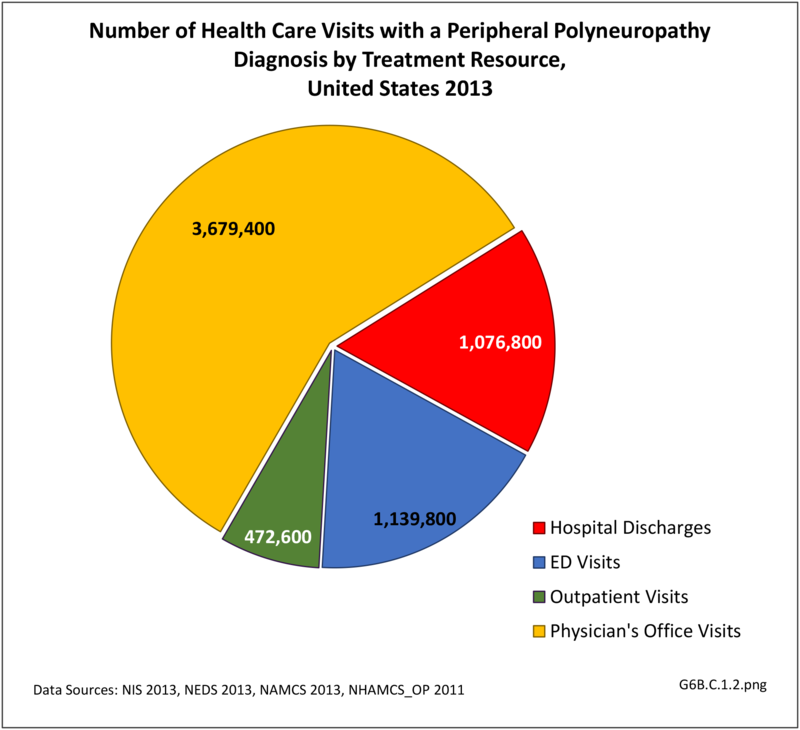 Diabetic peripheral neuropathy: Resource utilization and burden of illness. J Med Econ 2014;17(9):637-45. Motor neuron diseases (MNDs) are a group of rare disorders affecting motor neurons (nerve cells) that transmit signals from the brain to the muscles in the body. They present with muscle weakness and wasting, resulting in impaired walking, fine motor skills, limitations in activities of daily living, swallowing, speech, and eventually breathing. Motor neuron diseases can be classified into acquired (non-inherited) or inherited. There are no direct tests to identify MNDs, with diagnosis often the result of ruling out other conditions that early symptoms can mimic. In addition, there is no cure or standard treatment for MNDs. Generally, treatment consists of addressing symptoms, compensating for impairments, and providing palliative and supportive care. Some MNDs stabilize for long periods of time, while some rapidly progress to death in a few years. Amyotrophic lateral sclerosis (ALS), often known as Lou Gehrig’s disease, is the most common type of motor neuron disease. It is usually rapidly progressive, has an unclear cause, and lacks a definite cure. According to the ALS registry, prevalence is 4 to 5 per 100,000 people, affecting more than 13,000 people1 Prevalence has been increasing over time due to better identification of cases. It is a fatal condition with short life expectancy after diagnosis. 1. Mehta P, Kaye W, Bryan L, et al. Prevalence of amyotrophic lateral sclerosis - United States, 2012-2013. MMWR Surveill Summ 2016;65(8):1-12. The diagnosis of MND is made from the physician's interpretation of symptoms, while using selective diagnostic tests to confirm the diagnosis and rule out other mimicking conditions like spinal stenosis, cervical myelopathy or peripheral neuropathy. Diagnostic tests may include an EDx evaluation, lumbar puncture and MRIs of the spine and occasionally the brain. As there is currently no definitive cure for motor neuron disease, supportive care and prevention of unnecessary complications is the mainstay of management. Supportive care includes physical, occupational and speech therapy, respiratory care, nutritional and psychological support. Interdisciplinary care in a specialized center has been shown to provide superior care with slightly better survival in patients with ALS.1 Care is provided primarily at outpatient clinics, however, patients with debilitating symptoms require hospital admissions that are often lengthy and costly.2 Palliative care is required at the advanced stages of ALS. 1. Miller RG, Jackson CE, Kasarskis EJ, et al. Practice parameter update: The care of the patient with amyotrophic lateral sclerosis. Multidisciplinary care, symptom management, and cognitive/behavioral impairment (an evidence-based review): Report of the Quality Standards Subcommittee of the American Academy of Neurology. Neurology 2009;73(15):1218-26. doi: 10.1212/WNL.0b013e3181bc0141. https://www.ncbi.nlm.nih.gov/pmc/articles/PMC2764727/ . 2. Lechtzin N, Wiener CM, Clawson L, et al. Hospitalization in amyotrophic lateral sclerosis: Causes, costs, and outcomes. Neurology 2001;56(6):753-7. Incidence rates of ALS increase with age, peaking between 70 and 80 years. Amyotrophic lateral sclerosis is a fatal condition for most patients with mean life expectancy of about 3 years after diagnosis, although some patients live longer. 1. National Institute of Neurological Disorders and Stroke Disorder. Post-polio syndrome fact sheet: Who is at risk? https://www.ninds.nih.gov/Disorders/Patient-Caregiver-Education/Fact-She... . Accessed August 1, 2017. 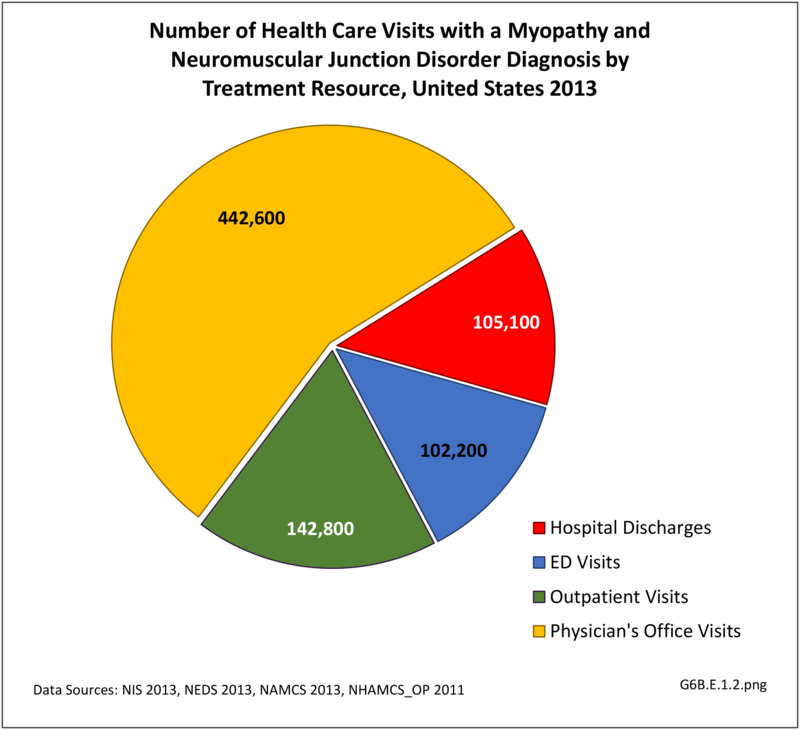 Patients with myopathy are likely to utilize ambulatory visits, specialist visits, and hospitalization more often than those without myopathy, according to a study of the patients with inflammatory myopathy in a large managed care system.1 Diagnostic tests, including EDx, blood and genetic testing and muscle biopsy, are often utilized to confirm clinical suspicions from history and physical examination, and to delineate the exact type and underlying etiology of myopathy. As cure is limited in most myopathies, treatment focuses on the supportive and symptomatic treatment. In the initial stages and/or milder forms of myopathy, treatment is usually at an outpatient clinic for physical, occupational, and speech therapy, and bracing if needed. In progressive and disabling myopathies, hospitalization is required to manage the secondary problems related to the myopathies such as respiratory failure. 1. Furst DE, Amato AA, Iorga SR, et al. Medical costs and healthcare resource use in patients with inflammatory myopathies in an insured population. Muscle Nerve 2012;46(4):496-50. doi: 10.1002/mus.23384. Spinal cord injury (SCI) is damage to the spinal cord, the bundle of nerves running from the base of the brain (brainstem) to the upper part of the lumbar spine. SCI disrupts communication between the brain and the rest of the body below the level of the injury, and depending on the severity resulting in the inability to move limbs, loss of sensation, bowel and bladder function. Depending on the underlying mechanism of injury, SCI can be divided into traumatic and non-traumatic causes. It can be further classified by the level of injury: tetraplegia involving all four limbs or paraplegia involving legs only; and the severity of injury: complete vs incomplete, with incomplete tetraplegia being most common. Significant trauma to the vertebral column encasing the spinal cord can result in spinal cord injury. In a person with a vulnerable bony spine, for example someone with osteoporosis or ankylosing spondylitis, weakness in the supporting structure, such as with rheumatoid arthritis or Down's syndrome, or narrowing of the spinal canal due to spinal stenosis, a minor trauma or injury can result in spinal cord injury. The common underlying cause of injuries include motor vehicle accidents, followed by falls, violence such as gunshot wounds or assault, sports injuries, and industrial accidents. The A merican Spinal Injury Association (ASIA) scoring system  is widely utilized by healthcare providers for further classification of SCI based on the injury level and severity. Spinal cord injury also can be secondary to multiple sclerosis (MS), inflammatory conditions, compression by bony spurs or herniated discs, and metastatic cancer, all disrupting spinal cord function. MS is a central nervous system (brain and spinal cord) disorder that damages the myelin sheath surrounding the nerve cells and fibers, and can presents with symptoms of spinal cord dysfunction, as well as disruption of vision, speech or cognitive function. A condition known as transverse myelitis is an inflammation across both sides of one level, or segment, of the spinal cord resulting in temporary or permanent symptoms that include paralysis and loss of sensation, bowel and bladder control. The segment of the spinal cord where the damage occurs determines the parts of the body affected, much like with a traumatic SCI. SCI is a life changing event affecting a younger population (average age at injury: 42 years old) and it is a cause of major disability. Annual incidence of spinal cord injury is approximately 54 cases per million in the US, with approximately 17,000 new cases of SCI each year. The prevalence is estimated to be 282,000 persons alive with a SCI in 2016.1 Patients are initially admitted to acute care units of hospitals for stabilization for an average length of stay of 11 days followed by inpatient rehabilitation with an average 35 day length of stay.1,2 As cure is limited in most cases of SCI, patients require continuous outpatient care including intermittent physical, occupational and speech therapy, pain management, and prevention of complications directly or indirectly related to SCI including deep vein thrombosis, pressure ulcers, pneumonia and urinary tract infections. 1. a. b. Spinal Cord Injury (SCI) 2016 Facts and Figures at a Glance. J Spinal Cord Med 2016;39(4):493-4. 2. a. b. Spinal Cord Injury (SCI) Facts and Figures at a Glance. J Spinal Cord Med 2016;39(3):370-1. https://www.nscisc.uab.edu/Public/Facts%202016.pdf  Accessed May 18, 2017. 1. a. b. Spinal Cord Injury (SCI) Facts and Figures at a Glance. J Spinal Cord Med 2016;39(3):370-1. https://www.nscisc.uab.edu/Public/Facts%202016.pdf  Accessed May 18, 2017. 2. New PW, Marshall R. International spinal cord injury data sets for non-traumatic spinal cord injury. Spinal Cord 2014;52(2):123-32. 3. Groah SL, Charlifue S, Tate D, et al. 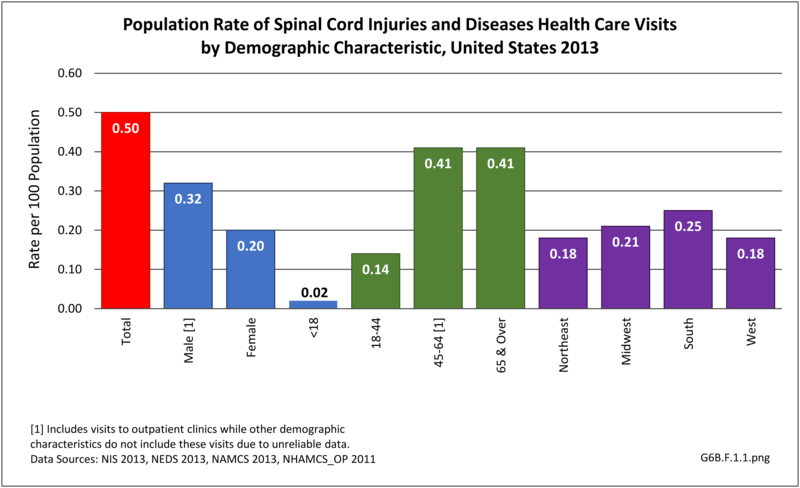 Spinal cord injury and aging: challenges and recommendations for future research. Am J Phys Med Rehabil 2012;91(1):80-93. 1. 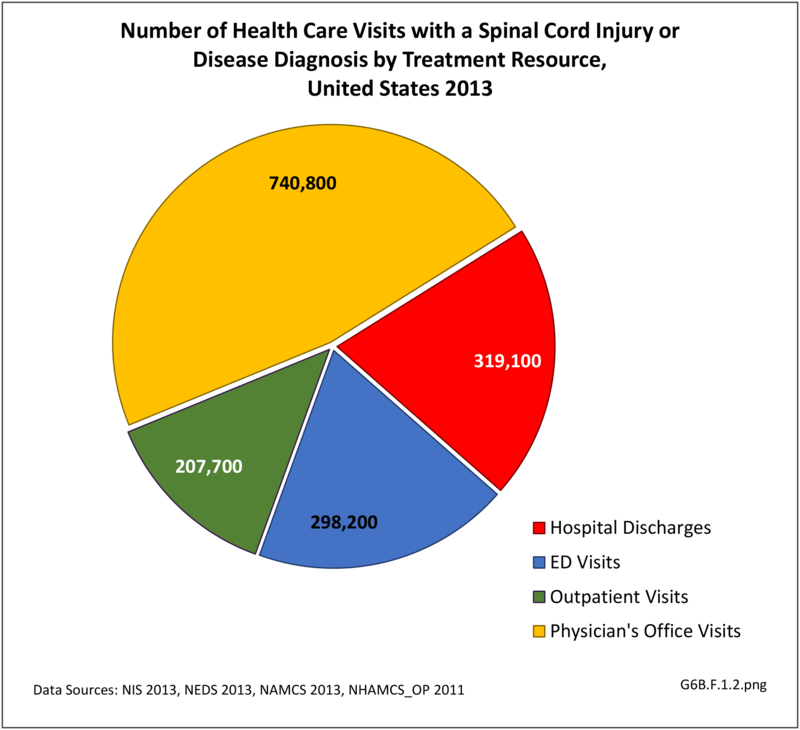 Spinal Cord Injury (SCI) Facts and Figures at a Glance. J Spinal Cord Med 2016;39(3):370-1. https://www.nscisc.uab.edu/Public/Facts%202016.pdf  Accessed May 18, 2017. 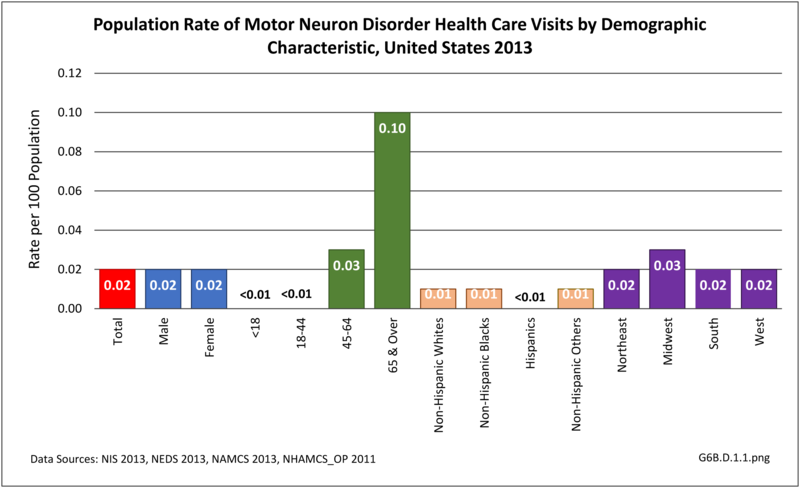 As discussed above, neuromuscular diseases become more prevalent as the population ages. The primary exception to this is spinal cord injuries or diseases, which occur in younger populations more than in the elderly. 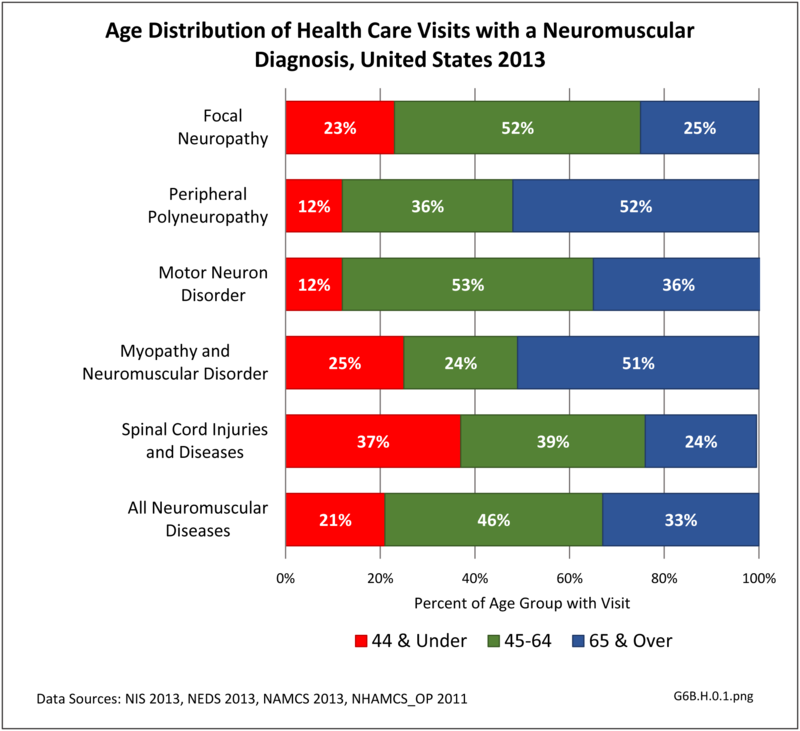 Total health care visits with a neuromuscular diagnosis reflected this trend in 2013, particularly in the middle age range of 45 to 64. Since many neuromuscular diseases are life-long conditions once they occur or are diagnosed, care will be ongoing throughout life. The true prevalence and burden of neuromuscular diseases is likely underestimated due to insufficient research in the area. These conditions often cause significant pain, motor impairment, loss of work and can lead to chronic disability. They may require lifelong rehabilitative care, utilizing many resources in the form of pain management, physical and occupational therapy, bracing, wound and nursing care. Quality of life can be severely affected. These are an important group of diseases not only because of their direct impact, but also their indirect impact leading to other musculoskeletal conditions such as accelerated degenerative joint disease, scoliosis and osteoporosis. They have a high caregiver burden, and often lead to emotional strain on patients and families. 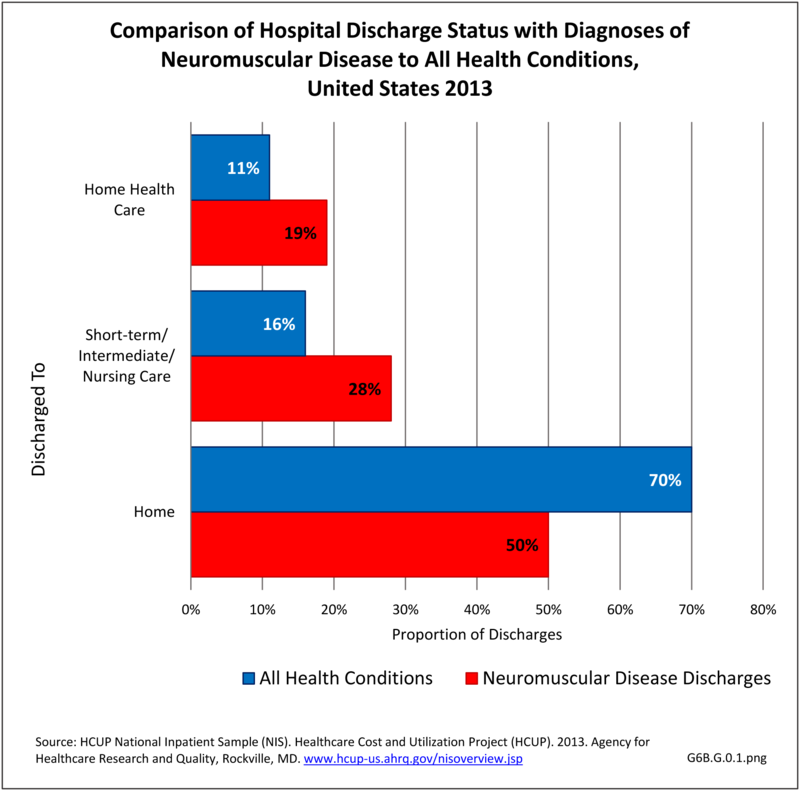 The datasets assessing hospital discharges are compelling in that patients with neuromuscular disease stay in the hospital longer, at a higher cost, and are discharged to places other than home more often. This does not tell the whole story, however, as many of these conditions are treated in the outpatient setting. Relying on diagnosis codes can also underestimate prevalence since many patients are admitted or treated in an outpatient setting based on symptoms, without a clear diagnosis. Often the diagnosis is clinical, and the correct diagnostic code not used. There is a scarcity of research on cost effective health care model systems for those with neuromuscular disease despite increasing direct and indirect financial burdens on patients and their families. Despite the recent introduction of the patient-centered outcomes research institute,1 there is a shortage of outcome based research from the neuromuscular patient perspective. Current postgraduate education and training of clinicians is limited in the management of chronic neuromuscular disease. This includes prevention of complications (for example, prevention strategies for falls specific to this population), and cost effective management at the community level (for example, home based interventions using information technology/telemedicine). 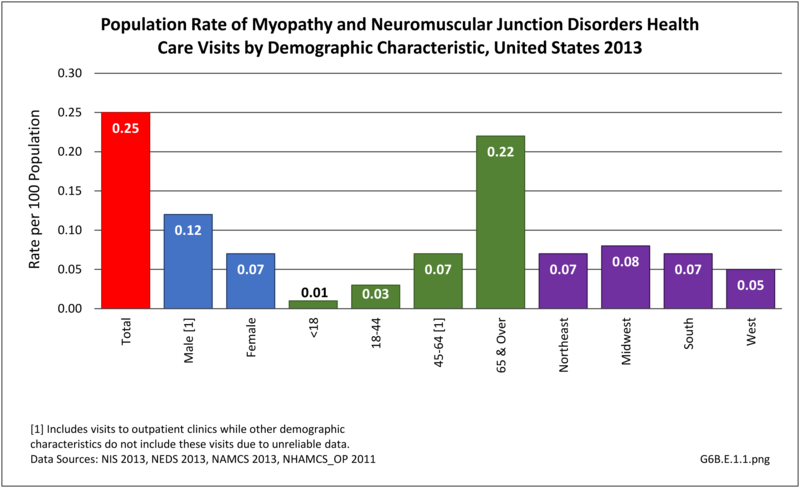 There is a lack of training and resources available to primary care providers who manage patients with neuromuscular disease in typical community settings. The ever increasing demand on physicians to see high volumes of patients may also be impacting the quality of evaluations of neuromuscular diseases which typically require intense and lengthy historical intakes. Collaboration amongst interdisciplinary teams, rehabilitation specialists, health care leadership, public health stakeholders, researchers, and academic institutions to educate future healthcare providers in neuromuscular disease care could be improved. 1. Selby, JV, Lipstein SH. PCORI at 3 years—progress, lessons, and plans. N Engl J Med 2014;370(7):592-595. doi: 10.1056/NEJMp1313061. 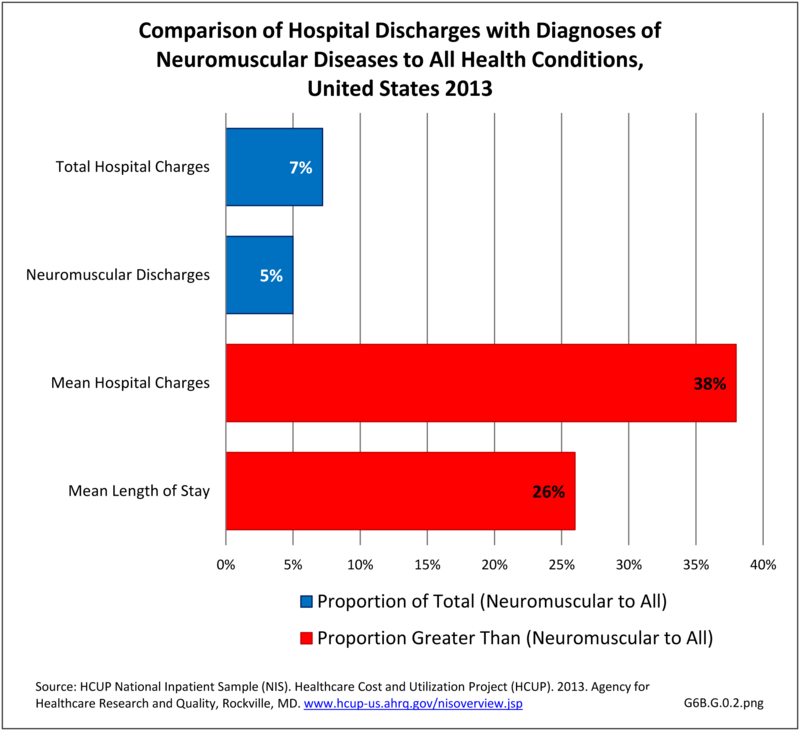 One of the key challenges in the care of people with neuromuscular disease is that patients are living longer with these often chronic diseases. . As other disabling musculoskeletal and non-musculoskeletal disorders occur in this population, it can be harder for individuals to maintain quality of life and independence. Pain management for patients with neuromuscular diseases can be challenging, especially with the current opioid epidemic.1 Better biopsychosocial approaches to pain management need to be developed and implemented. The increasing demand from the aging population with neuromuscular disease and a shortage of trained health care providers may place an excessive burden on communities. Furthermore, access to comprehensive care will be difficult for individuals with moderate to severe neuromuscular disorders requiring an interdisciplinary approach, especially in less populated areas. Controlling costs of medical care without compromising quality is another great unmet need, but not one unique to neuromuscular disease. 1. Sommer C. Peripheral neuropathies: Long-term opioid therapy in neuropathy: benefit or harm? Nat Rev Neurol 2017;13(9);516-17. doi: 10.1038/nrneurol.2017.101.